If you set out to design an active adult community for residents of retirement age near Daytona Beach, Florida, what would it include? A pool? A fitness center? Places for indoor and outdoor games and gatherings? You’ll find all those things and much more at Bear Creek, an active adult community for residents 55 and older in Ormond Beach, a little north of Daytona Beach, FL. After all, we want to make sure you’re never bored, even when simple relaxation and a friendly chat with neighbors are at the top of the day’s agenda. That’s why our gated community of high-quality manufactured homes includes not one but three clubhouse complexes. Each is designed to help you enjoy pastimes that range from cozy conversation in our rustic lodge-style clubhouse or its secluded pool to enjoying a high-energy workout in our clubhouse that boasts fitness equipment, an aerobics room, and a lap pool. 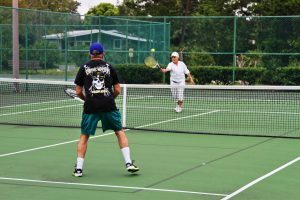 Our third clubhouse offers numerous amenities to help our residents get acquainted, from lighted courts for tennis, pickleball, and shuffleboard to a banquet hall and a tiki hut. In addition, Bear Creek is ideally situated to allow you to take day trips to other world-renowned attractions located near this exceptionally active adult community in the Daytona Beach, FL, area. So why wait? Contact us today to schedule a tour and see how you might fit in at exciting Bear Creek.